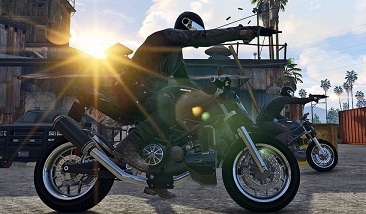 In Bikers, the latest DLC for the GTA Online, you can set up a motorcycle club (MC) and the members - the initial prospects - will become your family. You can start as a CEO, as well as a career in Prospect MC. So build your own realm and a respected business. You have to develop a sense of wise investments and make "friends". Important is the protection of your neighborhood as a biker. It is not difficult to set up your own motorcycle gang. Visit to the site of the Maze Bank, where you can find and buy your clubhouses, since these are subject to enforcement. Particularly cheaper is real estate in the desert. You can also set up your headquarters in the middle of Los Santos but houses in the city could be a little more expensive. You can customize the clubhouse of the motorcycle gang as well as yachts or the CEO offices. Of course for this you should have enough money in your wallet. In each clubhouse you can accommodate 10 of your own motorcycles and 7 bikes of your Prospects. If the responsibility is too high for you as the president of a motorcycle club, then you can also play it safe and initially only act as Prospect among bikers. The so-called Prospects are trial members in the motorcycle gang. As Prospect you will receive good money for your work. In addition, you will also receive Lifetime Points and Points session -you should collect this and downright accumulate because as you get more rewards you can increase your loyalty. - Call a "Hit Squad"
- Push other members with the steroid "Bullshark Testosterone"
Ride in formation not only has a fun factor, but also in other respects: ride in formation with your motorcycle club, then during which regenerate both your health and your armor and - for whatever reason - repair your motorcycle while riding in Formation. Any damage, such as flat tires are fixed here. - Only the president himself can arrange driving in formation and also the Prospect in the role of road captain. - The positions in a formation can be determined by yourself. - The individual areas are then shaded, so that everyone knows what positions are to be filled; all bikers have taken their place, then the formation is activated. - The President, who set the lineup for his MC, can also determine and limit the speed - so go all the rockers at the same pace. Once you have established your MC and recruited Prospects, then eventually you have the chance to make money. There a number of activities and challenges await you, where you can also collect valuable RP. For this you have 4 different missions or Modes to choose from: Clubhouse Contracts, Small missions: Club Challenges, Member Challenges (Challenges for prospects) and Free mode: Club Work. - Objectives: diverse for example: affect an arms deal in your favor, take over the defense of a convoy, off a target or protect civilians. - Eleven missions of this kind await you. - Only 3 missions can be active simultaneously, but your mission list update regularly. - You must be a member of each motorcycle club, which the Mission has started. Only then you will get money to complete the mission - money and RP. - If you are going solo or Prospect of a rival motorcycle clubs, then you only get money and RP. You can earn money and RP during this club challenge, when you as Prospect against another Prospect of Motorcycle Clubs. - Search and Destroy: Here you must see a certain place, find the appropriate target person and take him down. - Wheelie Rider: Set the longest possible wheelie with your bike back and hold it up better than your opponent. - Criminal Mischief: Do you remember the Road Rage? It is your job to use as much damage as possible on other cars with the melee weapon while driving. Who makes the most damage, of course will win. - Rippin 'It Up: start by the contractor: You have to find out who can do the most damage, while he is on the road on his bike. - On The Run: Start by the Sergeant at Arms: At the start all members of the motorcycle gang should close together here, otherwise you cannot start the challenge. Thus, all prospects receive a search level of 5 stars - the one who survives the last will win. - Race to Point: Start by the street Captain: Here you have the race to the clubhouse or another anywhere on the map will win. - Hit and Ride: Start by the Vice-President: It sets a time limit and you have at this time the most kills can boast among pedestrians. - Deathmatch (Requires Invitation): Performs a deadly battle against another player of the MCs. - Joust (Requires invitation): This is a deathmatch, which is carried out on bikes and in a certain area. - Stand Your Ground: You have to reach a certain area and defend it. - Caged In: You are into an area which is getting smaller. Stay within this radius and attack other players on your bike with your melee weapon.